This post is sponsored by Green Kid Crafts- earth friendly fun delivered right to your door! This week we are learning all about bugs as part of our Camp Mom Bug Week! We decided to make some caterpillar projects from objects that we found around our house, inspired by the Green Kid Crafts goal of engaging kids with nature and the world around them using non-toxic, natural, and sustainable supplies. Caterpillars have been a favorite at our house since my son was a baby and we read The Very Hungry Caterpillar by Eric Carle to him at least once a day. Here are two of the earth friendly caterpillar crafts we came up with this week based on things we discovered around our house. Supplies Needed: gift wrap tube (or toilet paper tolls), scissors, non-toxic washable paint, pipe cleaners, reused buttons, wool yarn, markers, glue, and a hole punch. 1. Cut the gift wrap tube into small pieces (this was a mom job). 2. Roll the tube pieces in paint and then let them dry. We tried using a paint brush but rolling was faster! 3. Glue buttons on for eyes. We added a dab of black paint for the pupils. 4. Punch holes and thread pipe cleaners through the top of the tube for antennae. 5. Punch two holes in each tube (one on either side). 6. Thread the yarn through the holes and layer the tube pieces in a row to create your caterpillar. We created a color pattern while we laced the yarn through the tubes. 7. Pull the yarn through the front and leave it extra long so that it can be a caterpillar leash. 8. Take your caterpillar on a bug hunt around the neighborhood! My son was cracking me up with all of the things he did with his caterpillar. They even did some swinging on the hammock together. The caterpillar held up surprisingly well considering all the walking it did! When the thread pulled apart after a lot of use, we got to practice threading the tubes all over again! I thought this project tied into these goals perfectly since it started off with a rock hunt! I think this was my son's favorite activity of the day because it allowed him to run around while discovering new things. Supplies Needed: rocks, non-toxic paint, paintbrushes, buttons, paper, scissors, and markers. 1. Go on a rock hunt and find a variety of round flat rocks. We're lucky that my parents have several ginormous rock-filled empty lots right across the street from them. My son was in heaven! 2. Choose your favorite rocks. 3. Paint them a variety of bright colors! 4. Let them dry while you run around and find some more rocks. 5. Glue on some button eyes and add a mouth with markers. 6. Decorate the rocks with markers and add some cut paper antennae with glue. 7. Once dry, stack the rocks and make patterns to create a caterpillar. 8. Knock them down and start all over again! Talk about the different patterns, colors, and rock designs while you create. One of the things that I loved about both of these projects is that although we used the materials to create a specific product (caterpillars), the supplies could've been used in a variety of different ways to create other bugs or projects. Despite the adorable end product, the process of creating these darling creatures ended up being the most fun! 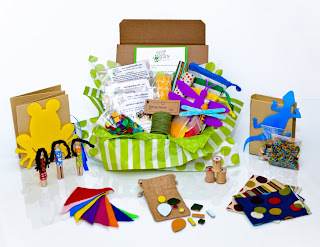 Here's a picture of a sample Green Kid Crafts Discovery Box if you've never seen one before. Boxes are based on a theme and come with instructions that serve as jumping off points for kid creativity. 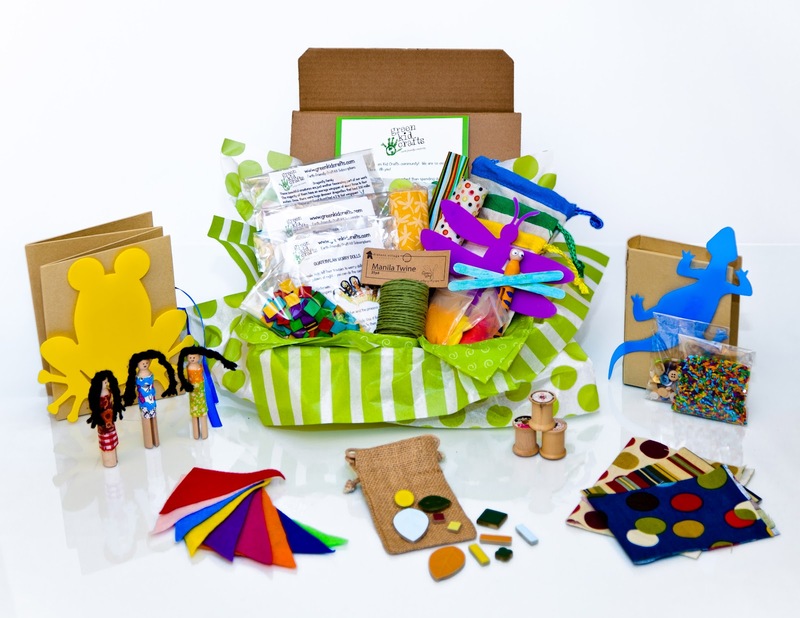 In addition to selling monthly subscription boxes, Green Kid Crafts has a Facebook page and Craft Blog where they share loads of earth-friendly crafts and activity ideas. This week they shared a simple bubble recipe on the craft blog. Green Kid Crafts Facebook fans are eligible for a special offer right now on new or gift subscription orders... so click here to find out more details! As a mom of two very active kids, I definitely love that these craft boxes provide projects and activities that encourage us to get outdoors, engage with nature, and get moving! If you're looking for some more caterpillar (and butterfly) craft and activity ideas, here are a few others that we discovered this week! 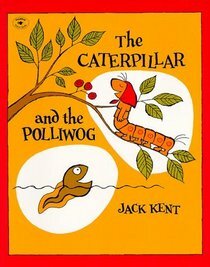 Do you have any other favorite caterpillar crafts or activities? 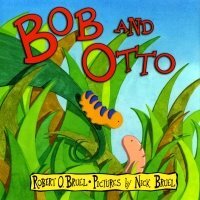 How about any favorite caterpillar picture books? Please share them in the comments! Disclosure: This is a sponsored post on behalf of Green Kid Crafts. All posts reflect my personal opinion and endorsement and are not swayed by compensation and/or free products. Please note that this post reflects my opinion and preferences and you might not share that same opinion. thanks for including our recycle caterpillar! I LOVE the rock caterpillar! Might need to try that one soon! These are so cute! and I love the fact that you used things you had around your house to make the caterpillars! Just posted on Craft Gossip! We love painting rocks so that would be something we would all enjoy doing together. 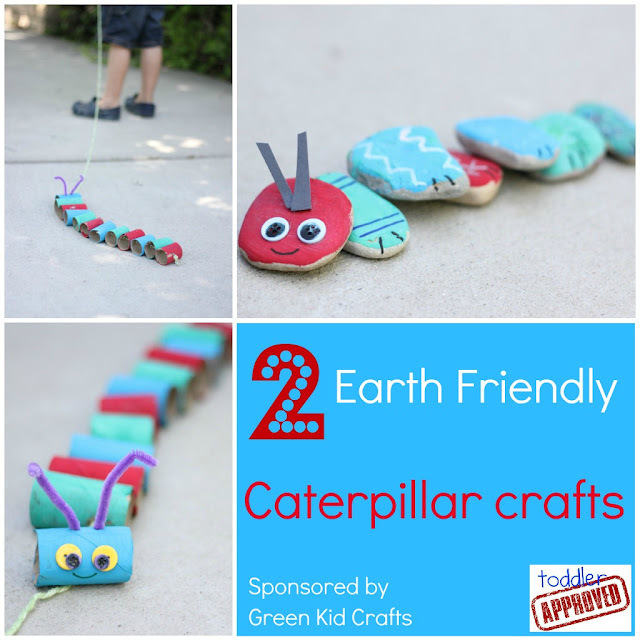 Earth friendly caterpillar crafts would be fun and make for some great bonding time as well.